Only You Can Prevent Preventive Maintenance - AutoNetTV Media, Inc.
OK – you don’t TRY to prevent preventive maintenance, but occasionally you may get in the way. 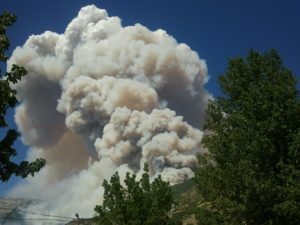 An illustrative story first: on July 3 someone poked their head in the door of our management meeting and told me my wife called and said that the mountain behind our house was on fire. That was about 3 o’clock. I was home 20 minutes later. The fire had started around 2:15 at a construction site and had spread to about 500 acres within the first hour. This picture was taken from my back yard about an hour after the fire started. Our older kids rushed over and we quickly packed up some irreplaceable things; family pictures and hand molds we made with our boys before they died and we grabbed some essentials for a few days away. We were ready to go when the 15 minute mandatory evacuation notice came at about 4:45. 500 homes were in the evacuation zone. After the family was safely on their way to a hotel, I drove around the neighborhood checking on other families. Some hadn’t heard about the evacuation. Others were packing or already gone. Then there were those who thought the evacuation was nonsense and refused to get ready to leave. Now, the fire had gone from a spark to close to a thousand acres in less than 3 hours. Our county had had no measurable precipitation for over a month (Utah is a desert, for crying out loud), it was nearly 100 degrees and the wind was blowing. And there were all these people telling me that they thought the fire would go the other way. Do we live in the same reality? Faced with a natural disaster, the “I’ll ride it out” mentality seems pretty foolish to me. But I have to admit that when it comes to automotive repairs and maintenance, I have been guilty of wishful thinking. Once my wife’s van had a clunk in the front end when turning: I was thinking bad bearings or a bad CV axle, neither of which I was eager to pay for. For a couple of weeks I would ask, “Hon, how was the van today – is it getting any better?” Of course it didn’t get any better. And then there are those times that I’m due for new shocks or some other preventive maintenance service and somehow another month or two or three goes by. What I’m saying is we all need a little help. When I bring a car in I know there are some things I’ve put off. I may suspect some problem, but really don’t want to ask about it. And there are things that just slip my mind. I really need my service advisor to ask me if I have any other concerns; have I done X, Y & Z. I need a multi-point inspection. Recently, one of our Digital Menu Board users shared something. He said that when business is slower, they do a very good job of bringing up scheduled maintenance services and finding other concerns with an inspection. This helps them keep their revenue up and helps their customers take better care of their vehicles. But when they are really busy, he confesses, they tend to just focus on the jobs the customers specify when they come in. This keeps the bays moving – but allows opportunities to do better for their customers to slip away. He says his Digital Menu Board fills in some of the gaps when they are busy. It graphically reminds his customers about other services and motivates them to ask if they could benefit from taking care of them. This results in adding more lines to the repair order that day and future appointments for things that can’t be taken care of right away. He’s loves feeling that he’s taking better care of his customers – and the additional revenue is always welcomed. Let me wrap up the fire. When we went to bed the night of the 3rd, the fire was at about 1,500 acres. When we woke up it was at 2,800. Next morning (the 5th) the fire was reported to be at around 5,000 acres. The forecasted 20% chance of scattered showers that morning turned into a soaking rain that lasted all day. The rain knocked the starch out of the fire and it was able to be contained over the next week, although there are still flare-ups here and there. No homes were lost due to the well-coordinated and massive efforts of firefighters from all over the country. Amazing work. And I for one don’t think it was a coincidence that the only heavy rain we’ve had in 60 days hit at exactly the right time to turn the tide of what could have been disaster. Sometimes we’re blessed, sometimes we’re lucky, and other times we’re prepared: Being prepared is the only one of the three we can work into our business success plan.